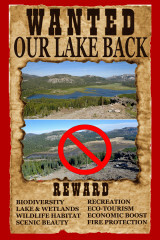 There have been plenty of unfounded statements by the Truckee Donner Land Trust and their supporters that draining Van Norden Lake will not affect the existing wetlands in the Donner Summit Valley. It of course makes no sense that removing millions of gallons of water stored in the lake would not have significant effects on the vegetation in the surrounding wetlands. The Land Trust claims that the “scientific” data will support their counter intuitive claims. So let’s take a look at some real scientific data. 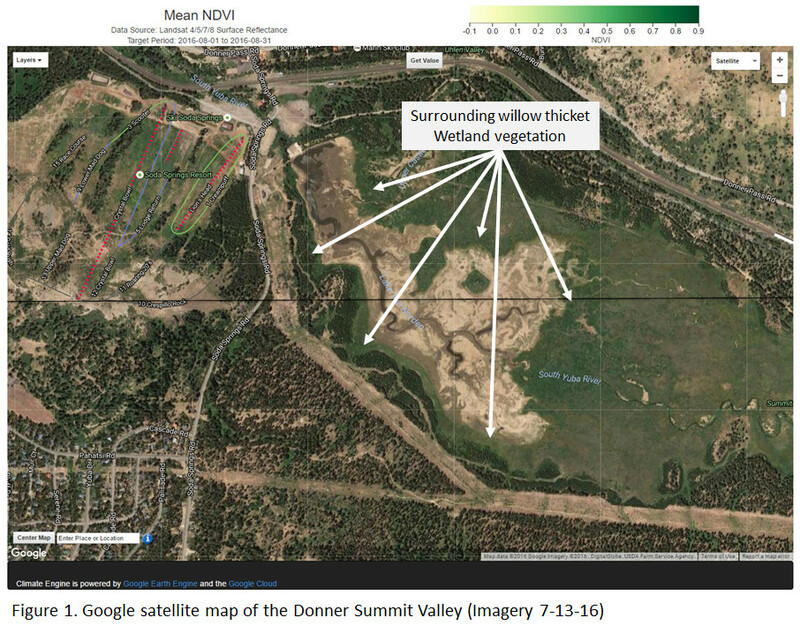 Now that we have seen the arid conditions in the Donner Summit Valley with the lake drained, it is possible to actually analyze data from the LandSat satellites that measures the vegetation in the Summit Valley. Scientists commonly use what’s called the NDVI (Normalized Difference Vegetation Index) to measure the volume of live green vegetation in an area. The data comes from satellites that measure the reflectance of light in the photosynthetically active radiation spectral region, 400-700 nm. The NDVI is an index value that quantitates the amount of vegetation using the reflectance measurements. Thanks to the internet, anyone can get access to the LandSat data these days. Moreover, thanks to the scientists at ClimateEngine.Org that have made the ClimateEngine website available to everyone, it is now possible to visualize the NDVI data for the Donner Summit Valley. I would like to thank Dr. Benjamin Hatchett from the Division of Atmospheric Sciences at UNR for pointing me to this wonderful website. We would urge anyone that is interested to visit their site and run the engine analyses for themselves. The ClimateEngine allows one to ask many questions about the vegetation data. It enabled us to ask the very specific question of “What was the effect of draining the lake on the surrounding wetland vegetation” and get a clear visual answer. We chose to look at the vegetation data for the month of August in 2016. This was the first full month in which Van Norden Lake was completely drained. 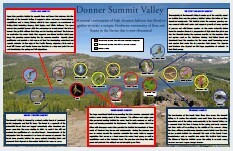 In Figure 1 the Google map of the area shows the Donner Summit Valley with the drained lake. The ClimateEngine made it very easy to see just how the NDVI had changed by only looking at the percent of change from the average values over the period of 1982-2016. Using this criteria eliminates any natural seasonal decreases and ony looks at the differences due to draining the lake. Those values are shown in Figure 2. 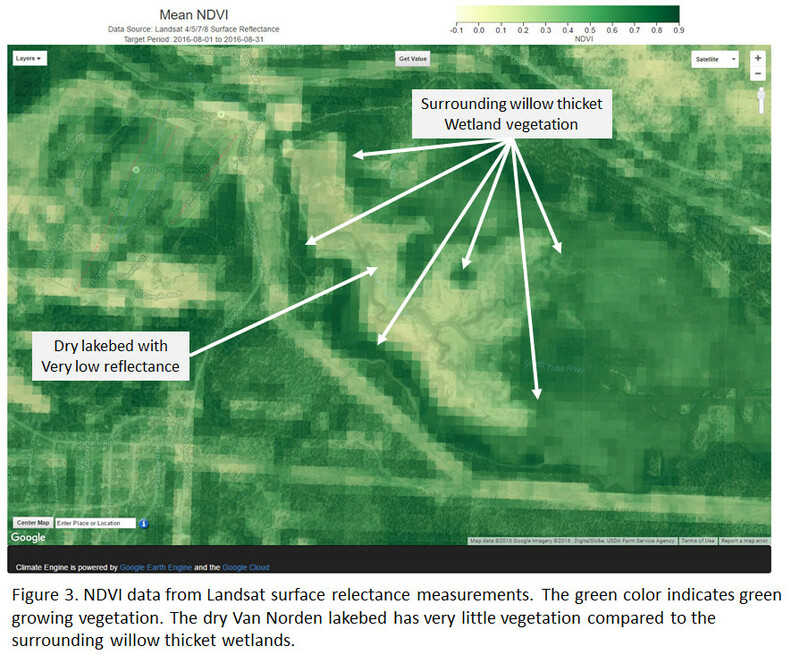 The data clearly show that the vegetation decreased significantly for the wetland vegetation surrounding the dry lakebed. This is of course not surprising considering that the water essential for growth had been removed. One might notice that the dry lake bed area actually looks like there has been a significant increase in vegetation. I’m sure the Land Trust would point to this as supporting their arguments. However, the strong green color in the lakebed is an artifact of the fact that during the 1982-2015 period there was water in the lake. Open water has a very low reflectance in the PAR range in comparison to the dry lakebed that is measured in 2016. As shown in Figure 3, the values for NDVI are very low in 2016, but still higher that when water was present. Since we are only looking at percent difference in Figure2, the green color in the lakebed is really an artifact of comparing very small values. 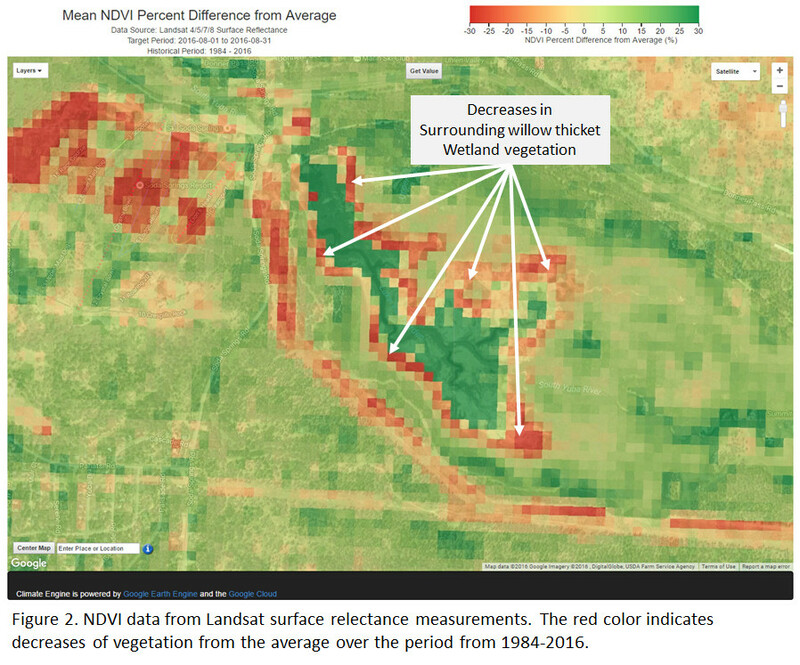 The take home info from this analysis of the data is that contrary to what supporters of draining the lake have claimed, the removal of Van Norden Lake will in fact reduce wetland vegetation just as common sense would predict. It should also be noted that in 2016, Van Nordon Lake was present in the valley during the months of June and July and provided nourishing water for the wetlands during their early summer growing period. If the Land Trust lowers the dam 5 feet as they plan, there will be no water during the early growing season. This would cause even a larger reduction in vegetation in the Valley. Yes the dry lakebed would eventually be populated by the grasses that exist in the rest of the meadow. But the existing biodiverse wetlands that support so much of the wildlife will be gone. The Land Trust is fond of saying “let the science” speak. It is speaking here. Is the Land Trust listening?